If you are an sommelier or wine aficionado these Wine Bottle Christmas Ornaments might be just the thing for you. In store they add to the festive visual merchandising look and feel of glassware and mug display, where they are not lost as they might be in a visually busy Christmas Ornaments display. They are also an adjacency that works in reaching out to the correct market. 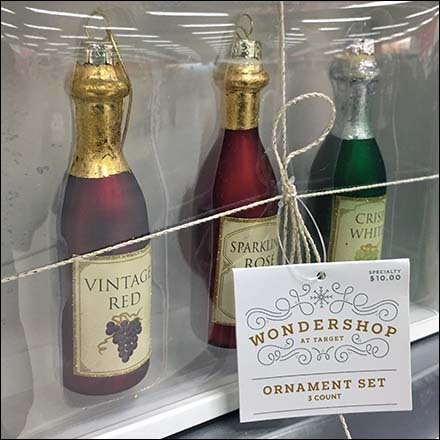 This Wine Bottle Christmas Ornaments by Wondershop a Holiday offering of Target.